Haggling or No Haggling When Buying a Car? Recently, for the first time in 12 years, my husband and I found ourselves in the market for a car. My husband hates negotiating, so the chore of haggling for a car fell on me. I had the misguided notion that the Internet would make price negotiation easier, but that assumption was wrong. Instead, I found that negotiating the price of a car is harder now than it was 12 years ago. There is definitely something to be said for car dealerships like CarMax that tote a no haggle price. But which is better? Haggling with traditional dealerships or going with a dealership that doesn’t play games? For us, the answer was the latter. We started our car search ready to haggle and get a good deal. Instead, all we got was frustration! 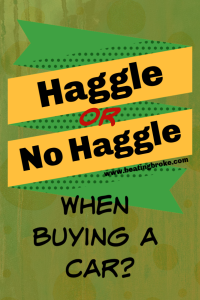 Should You Haggle for a Car? We religiously searched the Internet to find cars in our price range. We found one, called to confirm it was still there, and then made the 45 minute drive only to find out it had been sold. I doubt if it was even there when we called, honestly. Next, we went to another dealership, this time two hours away, to snag a good deal that we found online. However, unbeknownst to us, the dealer had an advertised Internet price, but below it, he had a disclaimer—plus dealer fees and extras. Well, the dealer fees and extras ended up being $2,700 more than the advertised price. Still, we wanted the car, so we tried to negotiate, but they would not budge much. After a few rounds of haggling, they were only willing to knock $1,500 off the dealer fees and extras, which would have had us paying $1,200 extra beyond the Internet advertised price plus the fees for the plates, taxes, etc. No thanks. Of course, once we drove home, they called us and were willing to negotiate some more. They still wouldn’t agree to the price we wanted, and we didn’t want to drive two hours again to get the car. By this time, we were fed up with our car search and the sales people’s tactics. Do you take any extra fees on to the advertised Internet price? Yes, the car was available, and no, there were no additional fees. We loved the car, and after our weeks of searching, we knew it was a good deal. The salesman almost immediately offered us an additional $600 off the advertised price, but he wouldn’t negotiate after that. That put the car right in our price range, and we happily took it. If you like to haggle, that might be the right technique for you. However, I found the process this time to be very frustrating. I’d much rather give my business to a dealership that prices the car appropriately (we checked this before we actually saw the car by checking the Blue Book price) and that doesn’t play number games. Have you bought a car recently? Did you haggle, or do you prefer to use a dealership that doesn’t play games? Melissa works as a freelance writer and virtual assistant from home while raising and homeschooling her three children, ages 13, 9, and 7. She blogs at Mom's Plans and writes about money saving tips, family, homeschooling, and cooking. I have once bought a car of which I negotiated quite a bit of the price. The thing was, there were so much of these cars being sold second hand that I didn’t really have to go to this particular dealer. Plus, this car was sitting on his lot for a few months already. I learned that everything in life is negotiable. Now of course, not everything has to be negotiated, but you could. My husband doesn’t like to negotiate either, so I usually do it whether it’s at a yard sale or car dealership. We’ve bought 2 cars together, one at a dealership and one private sale. I *sort of* negotiated at the dealership, but even though I felt good about it, I realized later that we really didn’t get a deal at all and ended up paying at the top end of our price range. The private party sale was much better and a whole lot easier. We showed up, drove the car, offered $700 under his asking price, he was comfortable with $500 under *which is what we had planned to pay*, so we handed over the money and off we went! I actually worked at CarMax for a short time, and the no haggle policy was very helpful, I thought. I agree with B above. If you can find a car that’s been sitting for a while the dealer is usually willing to haggle. The one we went to said they didn’t haggle at all. Then when we got up to leave they all of the sudden were able to take hundreds off the price. What a coincidence!